Rate analysis of brickwork requires the determination of quantities of materials (bricks and mortar) and labours. Mortar can be of any proportions 1:2, 1:4, 1:6, 1:8 etc. Quantity estimation for mortar is discussed here. The quantity estimation of bricks is required for the rate analysis. For the rate analysis of brick masonry, we will consider 1m3 of brick masonry. For 1m3 of brick masonry, the number of standard size of bricks required is 494. 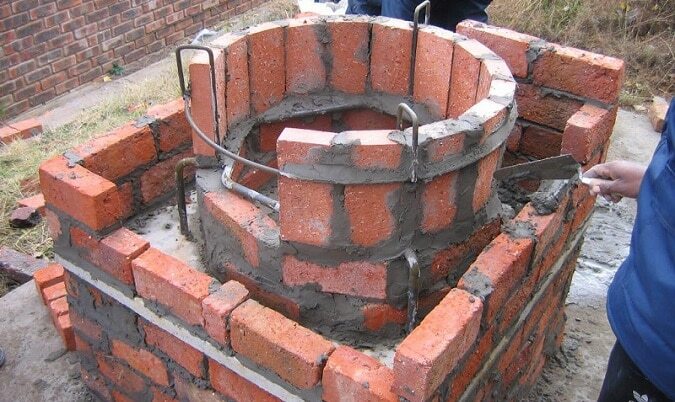 For 1m3 of brickwork, the quantity of the mortar required is 25 – 30%, i.e. 0.25m3 – 0.3m3 of cement masonry. For this example, we will consider 0.3m3 of cement mortar. We have already discussed how to calculate the quantity of materials, i.e. cement and sand for mortar here. Labours that are required for brick masonry are mason for brick work, labours for carriage of materials (sand, cement, bricks, and water), mixing and transporting mortar. The quantity of labour is expressed as requirement of labour in days for 1m3 of brick masonry. 1. Mason: The quantity of mason required for 1m3 of brickwork is taken as 0.94 days. 2. Labour: The quantity of labour for various works like carriage of materials, mixing of mortar, transporting of mortar etc. are clubbed. The labour required for 1m3 of brick masonry is for 1.57 days. The cost of various tools, transportation of materials etc. shall be suitably taken as lumpsum for the given location. Rate Analysis of brickwork now requires rates of various materials like cement, sand, bricks, and rates for labour i.e. mason and other labours. The rates of these varies with location and time. These may be obtained from the schedule of rates of particular location or can be taken from local market and shall be multiplied with the quantities of materials and labours we have estimated to get the rate analysis.